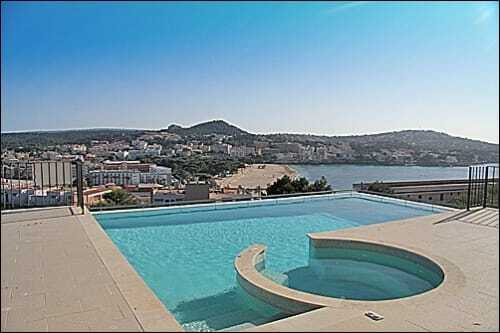 Recently renovated Mallorcan house with panoramic views in a calm and picturesque location in Santa Ponsa, Mallorca. The plot area of about 942 sqm is surrounded by flowering plants and has enough space for recreation and entertainment: a spacious outdoor area with a large sun terrace of 100 sqm, covered terrace of about 20 sqm, summer kitchen, BBQ, and huge pool of 30 sqm with a shower. The living area of 2-storey house of 255 sqm is distributed between bright living – dining room with a fireplace and fully equipped kitchen, 2 bedrooms with bathrooms, an office, utility room, and a guest apartment with private entrance, which has a separate kitchen, 2 bedrooms, and 2 bathrooms en suite. The modern design of the house blends perfectly with the traditional style, and the best quality equipment like air conditioning (hot/cold), PVC windows with double glazing, Jacuzzi, built-in wardrobes, intercom, alarm system, and much more create a high level of comfort and coziness. Apart of this, the property has a garage, outside parking spaces, and a pantry. Furniture can be purchased on request. The location supplies the best conditions for permanent residence: the main beach of Santa Ponsa and the center of the city with well-developed services, restaurants, cafes, bars, shops, supermarkets, pharmacies, etc. are situated very close. Nearby there are several popular golf courses, marinas, public and international colleges and sandy beaches.